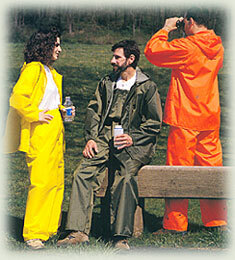 Rain Suit with Hooded Jacket Buy Now! Our rainsuits, complete with hooded jacket and waist-fit pants, make the perfect lightweight protection from the elements for the serious outdoor enthusiast. Engineered specifically for comfort and lightweight durability, our rainsuits make the perfect rain gear whether you're taking a long hike or embarking on a month long camping excursion.